How do we engage the UM community in conversations about our future? 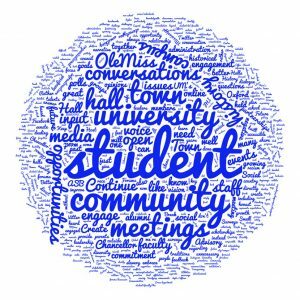 Word cloud highlighting Engagement feedback collected during the Town Hall Meeting on Aug. 29, 2016. During the 2016 Town Hall, we asked participants to provide ideas about how we continue to engage the UM community in the important conversations about our university’s future. We received 114 engagement ideas across six broad categories.